Sindh /sɪnd/ (Sindhi: سنڌ‎ ; Urdu: سِندھ‬‎) is one of the four provinces of Pakistan, in the southeast of the country. Historically home to the Sindhi people, it is also locally known as the Valley of Mehran. Sindh is the third largest province of Pakistan by area, and second largest province by population after Punjab. Sindh is bordered by Balochistan province to the west, and Punjab province to the north. Sindh also borders the Indian states of Gujarat and Rajasthan to the east, and Arabian Sea to the south. 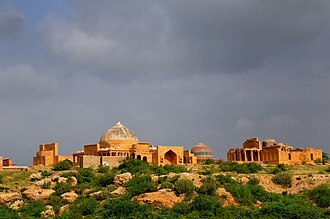 Sindh's landscape consists mostly of alluvial plains flanking the Indus River, the Thar desert in the eastern portion of the province closest to the border with India, and the Kirthar Mountains in the western part of Sindh. Sindh's climate is noted for hot summers and mild winters. The provincial capital of Sindh is Karachi, Pakistan's largest city and financial hub. Sindh has Pakistan's second largest economy. Karachi hosts the headquarters of several multinational banks. Sindh is home to a large portion of Pakistan's industrial sector and contains two of Pakistan's commercial seaports, Port Bin Qasim and the Karachi Port. The remainder of Sindh has an agriculture based economy, and produces fruit, food consumer items, and vegetables for the consumption other parts of the country. Sindh is also the centre of Pakistan's pharmaceutical industry. 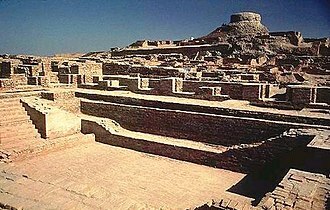 The Indus Valley Civilization (IVC) was a Bronze Age civilization (3300–1300 BCE; mature period 2600–1900 BCE) that was located in the northwestern region of the Indian subcontinent, consisting of what is now mainly modern-day Pakistan and northwest India. 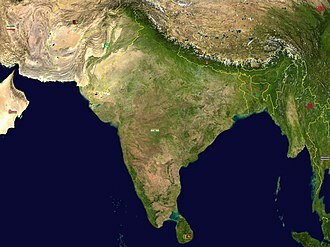 Flourishing around the Indus River basin, the civilization primarily centered along the Indus and the Punjab region, extending into the Ghaggar-Hakra River valley and the Ganges–Yamuna Doab. Geographically, the civilization was spread over an area of some 1,260,000 km², making it the largest ancient civilization in the world. There is an Indus Valley site on the Oxus river at Shortugai and extending towards Alamgirpur on the Hindon River located only 28 km from Delhi, India. The Indus Valley is one of the world's earliest urban civilizations, along with its contemporaries, Mesopotamia and Ancient Egypt. At its peak, the Indus Civilization may have had a population of well over five million. 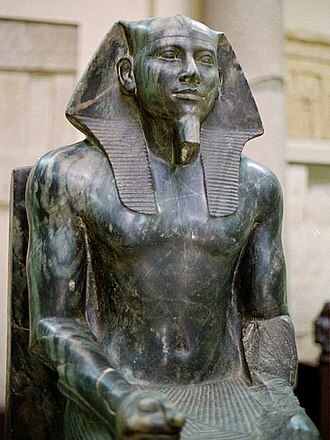 Inhabitants of the ancient Indus river valley, developed new techniques in metallurgy and handicraft (carneol products, seal carving), and produced copper, bronze, lead, and tin. The civilization is noted for its cities built of brick, roadside drainage system, and multistoried houses. Abida Parveen has popularized Sindh and Pakistan in the world. Zulfikar Ali Bhutto (Urdu: ذوالفقار علی بھٹو‬, Sindhi: ذوالفقار علي ڀُٽو‎, Sindhi pronunciation: [zʊlfɪqɑːɾ ɑli bʱʊʈːoː]) (5 January 1928 – 4 April 1979) was the 9th Prime Minister of Pakistan from 1973 to 1977, and the 4th President of Pakistan from 1971 to 1973. He was the founder of the Pakistan Peoples Party (PPP) — the largest and most influential political party in Pakistan— and served as its chairman until his execution in 1979 on charges of murder. His eldest daughter, Benazir Bhutto, would also serve as Prime minister, while his son Murtaza Bhutto, served as member of Parliament of Pakistan. .....that Sindhi is the native provincial language of Sindh? .....that Urdu-speaking Muslim migrants from India who settled in Sindh after the independence of Pakistan are called the Muhajir people? .....that Sindhology is a field of study and academic research that covers the history, society, culture, and literature of Sindh? .....that Karachi, the capital city of Sindh, was also the original capital city of Pakistan prior to Islamabad? .....that Lal Shahbaz Qalandar was a revered Sindhi Sufi saint who preached religious tolerance among Muslims and Hindus, and that the famous Pakistani qawwali Mast Qalandar is sung in his honour? .....that the Sindhi Cultural Day is observed each year on December 4, 5 and 6 to celebrate Sindhi culture? A view of the coastline along Clifton Beach, Karachi during the evening. ^ Pakistan Peoples Party (2011). "Pakistan Peoples Party (PPP)". PPP. PPP medial Cell. Retrieved April 15, 2001. .
^ a b c d Sharmila Farooqi, Member of PAS (2011). "ZA Bhutto — architect of a new Pakistan". Sharmila Farooqi, member of Sindh Provincial Assembly of Pakistan. Sharmila Faruqui. Retrieved April 15, 2001. Muhammad Ali Jinnah was the maker of Pakistan, Zulfikar Ali Bhutto was the architect of Pakistan. Punjab, is Pakistans second largest province by area after Balochistan, and its most populous province with an estimated population of 101,391,000 as of 2015. It is bordered by Sindh and Khyber Pakhtunkhwa, as well as the regions of Islamabad Capital Territory and it shares borders with the Indian states of Punjab and Jammu and Kashmir. The provincial capital of Punjab is the city Lahore, a centre of Pakistan where the countrys cinema industry. Punjab has been inhabited since ancient times, the Indus Valley Civilization, dating to 2600 BCE, was first discovered at Harappa. 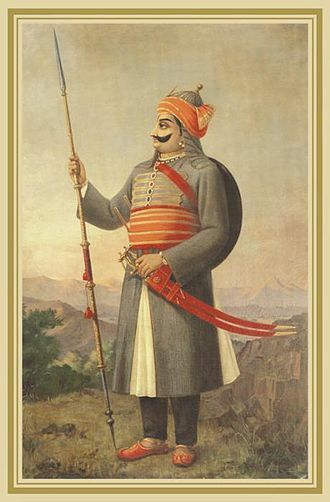 Punjab features heavily in the Hindu epic poem, the Mahabharata, in 326 BCE, Alexander the Great defeated King Porus at the Battle of the Hydaspes near Mong, Punjab. 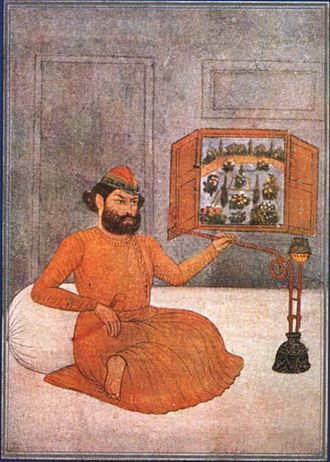 The Umayyad empire conquered Punjab in the 8th century CE, Punjab was invaded by Tamerlane and Nader Shah. 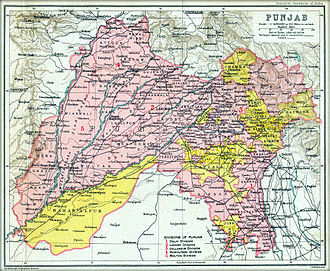 Punjab reached the height of its splendour during the reign of the Mughal Empire, following a successful rebellion, Sikh-led armies claimed Lahore in 1759. 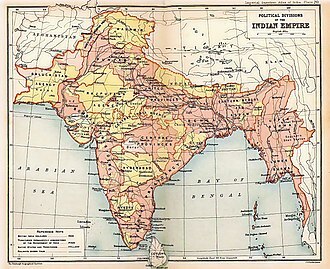 The administration of the Sikh Empire was based out of Lahore, the province was formed when the Punjab province of British India was divided along religious boundaries in 1947 by the Radcliffe Line after Partition. Punjab is Pakistans most industrialised province with the industrial sector making up 24% of the gross domestic product. Punjab is known in Pakistan for its prosperity, and has the lowest rate of poverty amongst all Pakistani provinces. Punjab is one of South Asias most urbanized regions with approximately 40% of people living in urban areas and its human development index rankings are high relative to the rest of Pakistan. Punjab is known in Pakistan for its relatively liberal social attitudes, the province has been strongly influenced by Sufism, with numerous Sufi shrines spread across Punjab which attract millions of devotees annually. The founder of the Sikh faith, Guru Nanak, was born in the Punjab town of Nankana Sahib near Lahore, Punjab is the site of the Katasraj Temple, which features prominently in Hindu mythology. The Arabian Sea is a region of the northern Indian Ocean bounded on the north by Pakistan and Iran, on the west by northeastern Somalia and the Arabian Peninsula, and on the east by India. 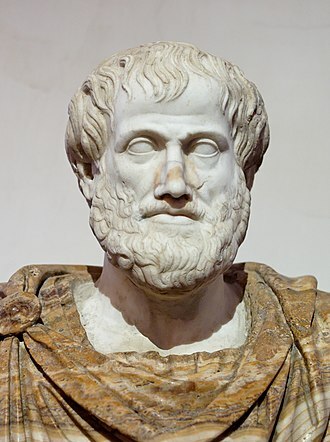 Historically the sea has been known by names including the Erythraean Sea. 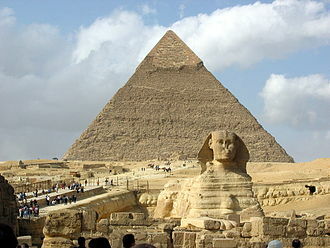 Its total area is 3,862,000 km2 and its depth is 4,652 metres. The Gulf of Aden is in the southwest, connecting the Arabian Sea to the Red Sea through the strait of Bab-el-Mandeb, the Arabian Sea has been crossed by important marine trade routes since the third or second millennium BCE. Major seaports include Jawaharlal Nehru Port in Mumbai, the Port of Karachi and the Gwadar Port in Pakistan, other important ports include in India, Kandla Port, and Mormugao in Goa. The largest islands in the Arabian Sea include Socotra, Masirah Island, Astola Island, the Arabian Seas surface area is about 3,862,000 km2. The maximum width of the Sea is approximately 2,400 km, the biggest river flowing into the Sea is the Indus River. There are the gulfs of Khambhat and Kutch on the Indian coast, the countries with coastlines on the Arabian Sea are Somalia, Yemen, United Arab Emirates, Pakistan and the Maldives. There are several cities on the seas coast including Mumbai, Karachi, Pasni, Aden, Keti Bandar, Duqm. International Hydrographic Organization defines the limits of the Arabian Sea as follows, the Eastern limit of the Gulf of Aden. A line joining Ràs al Hadd, East point of Arabia, a line running from the South extremity of Addu Atoll, to the Eastern extreme of Ràs Hafun. The Western limit of the Laccadive Sea, by the time of Julius Caesar, several well-established combined land-sea trade routes depended upon water transport through the Sea around the rough inland terrain features to its north. Each major route involved transhipping to pack animal caravan, travel through country and risk of bandits. 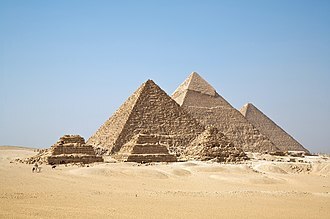 Later the kingdom of Axum arose in Ethiopia to rule a mercantile empire rooted in the trade with Europe via Alexandria, Jawaharlal Nehru Port in Mumbai is the largest port in the Arabian Sea, and the largest container port in India. The Port of Karachi is Pakistans largest and busiest seaport, handling about 60% of the nations cargo and it is located between the Karachi towns of Kiamari and Saddar, close to the main business district and several industrial areas. Kalibangān is a town located at 29. 47°N74. 13°E /29.47,74. 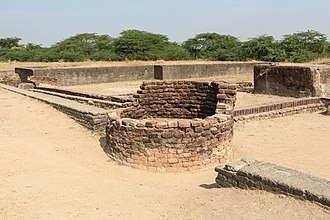 It is identified as being established in the triangle of land at the confluence of Drishadvati, the prehistoric and pre-Mauryan character of Indus Valley Civilization was first identified by Luigi Tessitori at this site. 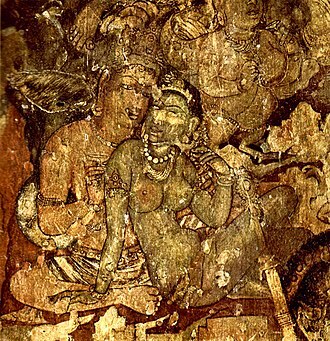 Kalibangans excavation report was published in its entirety in 2003 by the Archaeological Survey of India,34 years after the completion of excavations, the report concluded that Kalibangan was a major provincial capital of the Indus Valley Civilization. 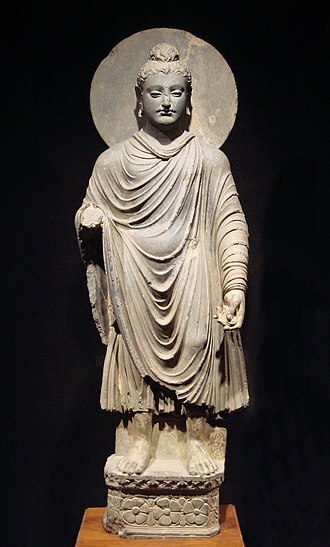 Kalibangan is distinguished by its unique fire altars and worlds earliest attested ploughed field, the identity of Kalibangan as a pre-historic site was discovered by Luigi Pio Tessitori, an Italian Indologist. He was doing research in ancient Indian texts. He was surprised by the character of ruins in that area, at that time ASI had some excavations done on Harappa, but they never had any idea about the character of the ruins. 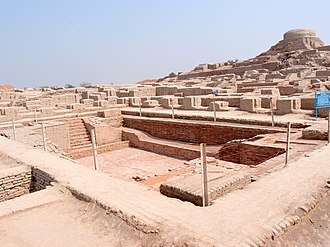 In fact, Tessitori is the first person to recognize that the ruins are Prehistoric, amlānand Ghosh was the first person to recognise this site as Harappan and marked it out for excavations. Under the leadership of B. B, Balkrishna Thapar, M. D. Khare, K. M. Shrivastava and S. P. Jain carried out excavations for 9 years in 9 successive excavation sessions. Two ancient mounds were excavated, spread over half kilometre, on western side is the smaller mound,9 meters high and known as citadel. 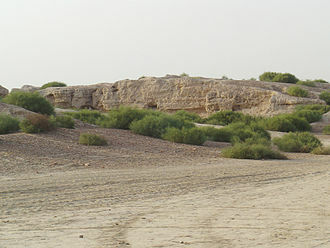 Eastern mound is higher and bigger, known as lower city, other nearby sites belonging to IVC include Balu, Kunal, Banawali etc. 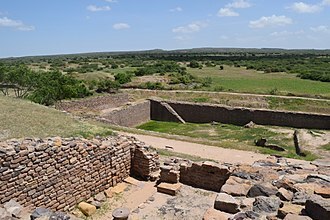 Traces of pre-Harappan culture have found only at the lower levels of the western mound. 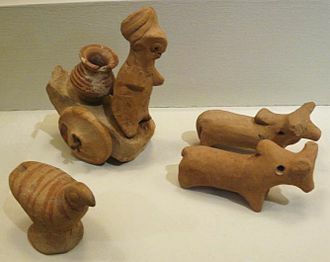 According to archaeological evidence, the Indus Valley culture existed at the site from the age to the Harappan age. This earlier phase is labelled Kalibangan-I or Period-I, similarity of pottery relates Kalibangan-I with the Sothi culture because a lot of this pottery was discovered at Sothi village in North Western India. 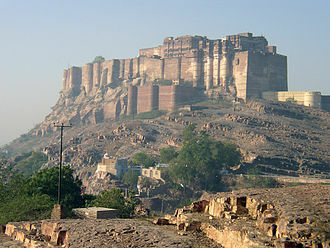 In this phase, the settlement was fortified, using dried mud bricks and this fort had been built twice in different periods. Earlier, fort wall had a thickness of 1.9 meters, brick size was 20 ×20 ×10 cm in both construction-phases. The Indus River, called Sindhū or Abāsīn, is a major south-flowing river in South Asia. The total length of the river is 3,180 km which makes it one of the longest rivers in Asia and it is the longest river and national river of Pakistan. The river has a drainage area exceeding 1,165,000 km2. Its estimated annual flow stands at around 207 km3, making it the twenty-first largest river in the world in terms of annual flow, the Zanskar is its left bank tributary in Ladakh. In the plains, its left tributary is the Chenab which itself has four major tributaries, the Jhelum, the Ravi, the Beas. Its principal right tributaries are the Shyok, the Gilgit, the Kabul, the Gomal. 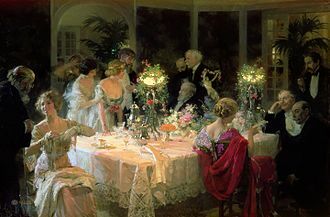 Beginning in a spring and fed with glaciers and rivers in the Himalayas. The Indus forms the delta of present-day Pakistan mentioned in the Vedic Rigveda as Sapta Sindhu, the river has been a source of wonder since the Classical Period, with King Darius of Persia sending his Greek subject Scylax of Caryanda to explore the river as early as 510 BC. 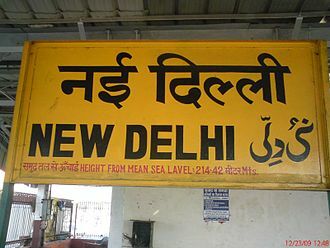 In Pali, Síndhu means river and refers to the Indus River in particular, the word Indus is the romanised form of the ancient Greek word Indós, borrowed from the old Persian word Hinduš which is in turn borrowed from the Sanskrit word Sindhu. Megastheness book Indica derives its name from the rivers Greek name, Indós, the ancient Greeks referred to the Indians as Indói, literally meaning the people of the Indus. 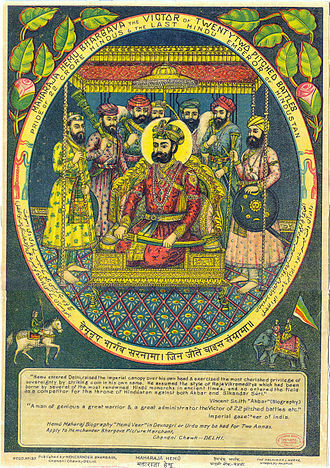 The country of India and the Pakistani province of Sindh owe their names to the river, Rigveda describes several mythical rivers, including one named Sindhu. The Rigvedic Sindhu is thought to be the present-day Indus river and is attested 176 times in its text –95 times in the plural, more often used in the generic meaning. In the Rigveda, notably in the hymns, the meaning of the word is narrowed to refer to the Indus river in particular. The Rigvedic hymns apply a feminine gender to all the rivers mentioned therein, Sindhu is seen as a strong warrior amongst other rivers which are seen as goddesses and compared to cows and mares yielding milk and butter. To the northwest of Lothal lies the Kutch (see also Dholavira) peninsula, which was a part of the Arabian Sea until very recently in history. Owing to this, and the proximity of the Gulf of Khambhat, Lothal's river provided direct access to sea routes. Although now sealed off from the sea, Lothal's topography and geology reflects its maritime past. Aerial picture of Port Qasim, with surrounding Mangrove forests.